iPad, iPhone, Android and Windows running app version 7.3 and above. Length: 5 hrs. 49 min. 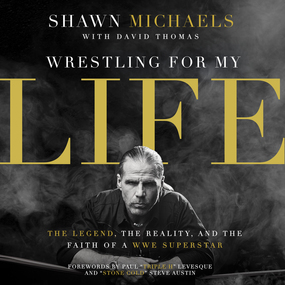 In Wrestling for My Life, WWE superstar Shawn Michaels shares from his heart about the highs and lows of his life inside the WWE. Included are some never-before-shared stories and an intimate look into his career as well as stories of hunting, family, and faith. With millions of fans, Michaels had adulation and all the attention he could ask for, but he discovered there was something more. When he became a committed Christian during his years in the WWE it had to affect everything. Michaels reveals what it is like to be a man of faith in this unusual world and shares insights for all of us.